Media caption"There are no words to describe it - no words"
Portugal is holding three days of national mourning for the victims of wildfires that raged across the country. At least 41 people died after hundreds of fires spread across central and northern areas on Sunday and Monday. They started in dry conditions and were fanned by strong Atlantic winds from Hurricane Ophelia. Across the border in Spain, at least four people died in wildfires in the Galicia region. However, a one-month-old baby who was believed to have died in Portugal's Tabua area has been found alive, the civil protection authorities told the Portuguese press. They also said the blazes had been brought under control. 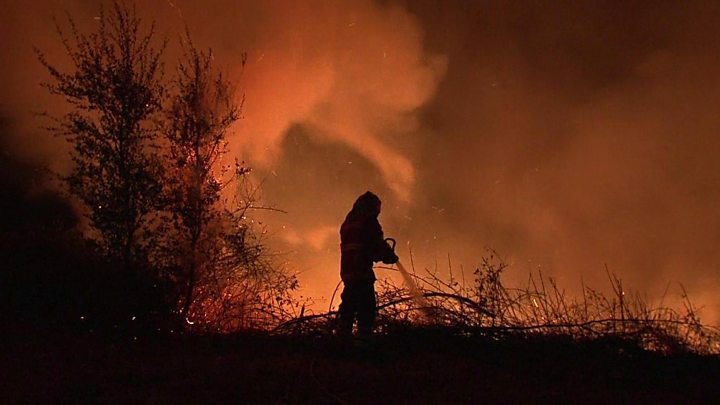 The number of fires had prompted Portuguese authorities to declare a state of emergency in areas north of the river Tagus - almost half its landmass. Prime Minister Antonio Costa issued a statement on what he called the largest wave of fires the country had experienced since 2006. He said his cabinet would meet on Saturday to adopt recommendations of a report on fire prevention, commissioned after a blaze in June that killed 64 people. "After this year, nothing should remain as it was before," he said. The June fire prompted a controversy over Portugal's state of preparedness, but on Monday Mr Costa ruled out firing cabinet ministers. Residents said they had little time to react. "The fire came at the foot of the village and spread at an incredible rate," Jose Morais, who lives in Vouzela in the Viseu region, told AFP news agency. "It felt like the end of the world. Everyone fled." In Spain's Galicia region, two of the victims were found together in a burned-out car on the roadside. Spanish politicians said the fires on their side of the border had been set by arsonists. Prime Minister Mariano Rajoy, who travelled to Galicia on Monday, said one fire had been started at five different points. "It's impossible for this to be triggered under natural circumstances." Interior Minister Juan Ignacio Zoido said authorities had identified suspects. Are you affected by the wildfires? Email us with your story at haveyoursay@bbc.co.uk.